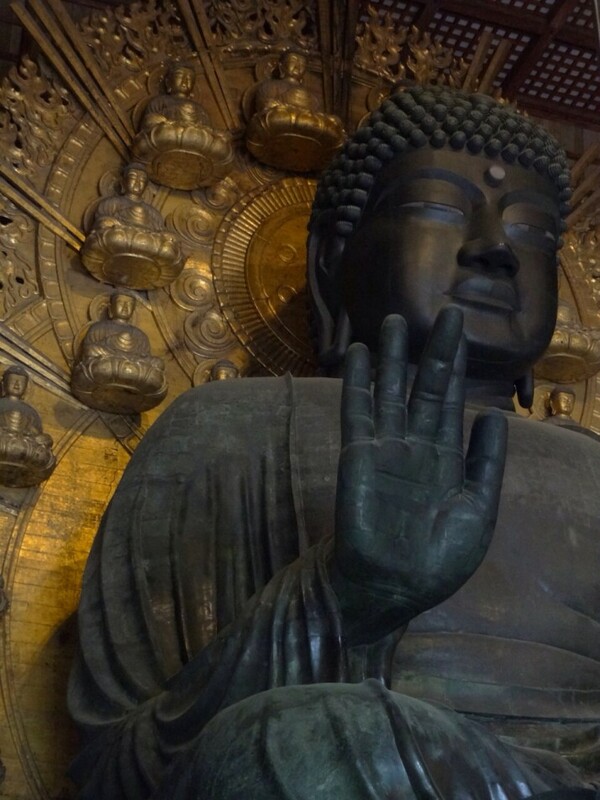 Briefly the capital of Japan, Nara contains a wealth of culturally important temples, the site of the former palace and the Kasugayama Primeval Forest, all are of which are recognised by UNESCO. This massive building is a reconstruction. It is three quarters of the size of the one it replaced, and it is so beautifully proportioned that our brains had difficulty comprehending its sheer size. From the end of the approaching pathway, the Daibutsuden looks about the right size, but then we realised we were a good 300 meters away, and the little stick figures on the steps were people! The Great Buddha just about fits the building, and as his head pokes into the rafters it gives the impression that he’s too big for the hall – it’s a nice illusion that arguably isn’t needed as this is one huge Buddha statue. The Buddha images behind it are scaled such they all appear to be the same size from the ground, and there are other large statues to keep him company. 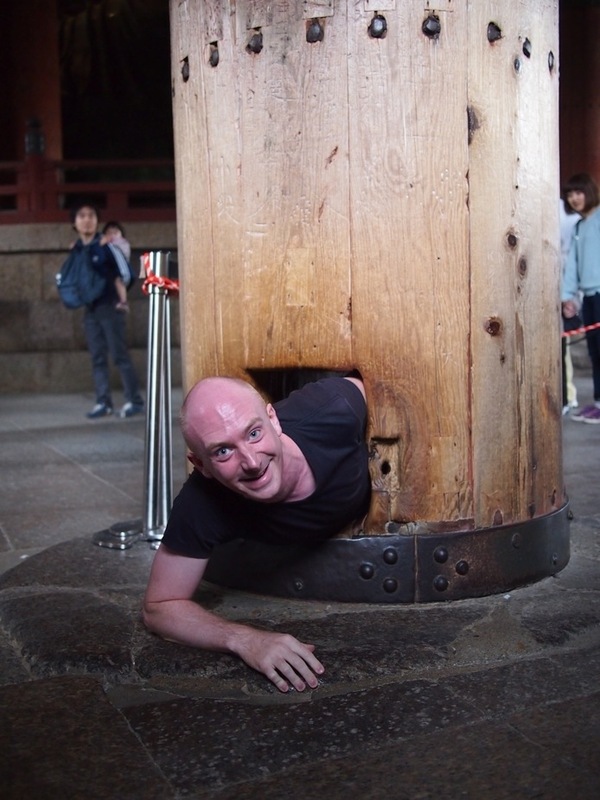 I was keen to find a specific pillar described in our guide book, as it contains a hole near its base that is the same size as the giant bronze Buddha’s nostril and, if you can fit through it, it is said you will be successful in your search for enlightenment. On my way to certain enlightenment by pulling myself un-aided through the Buddha’s nostril-sized pillar hole. 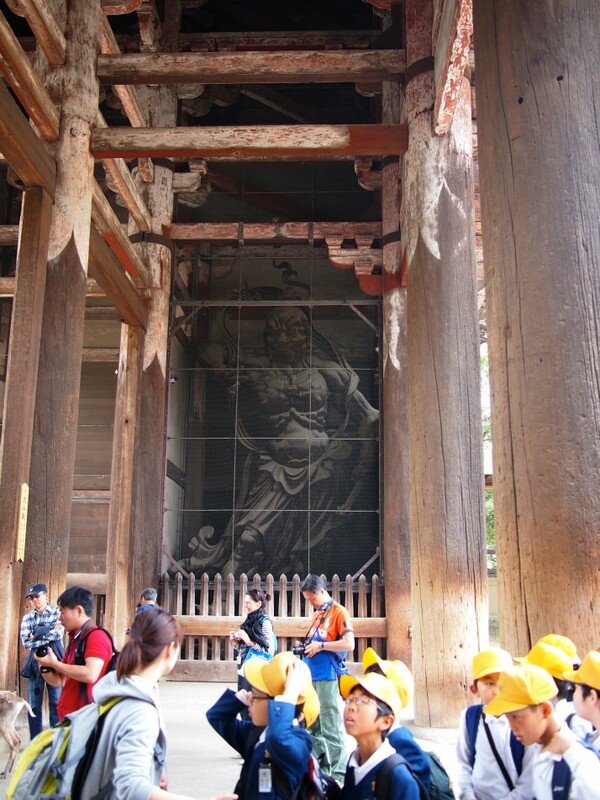 Of course, this also means that I’m the size of a huge bronze Buddha booger..
Outside, the giant Nandai-mon (temple complex gate) contains the two largest wooden Niō (guardian) statues we’ve seen. They’re perfectly scaled to match the rest of the Tōdai-ji. It would be remiss of me not to mention the Shinto messengers of the gods that roam freely throughout the Nara-kōen park area. And what are these protected National Treasures, you ask? 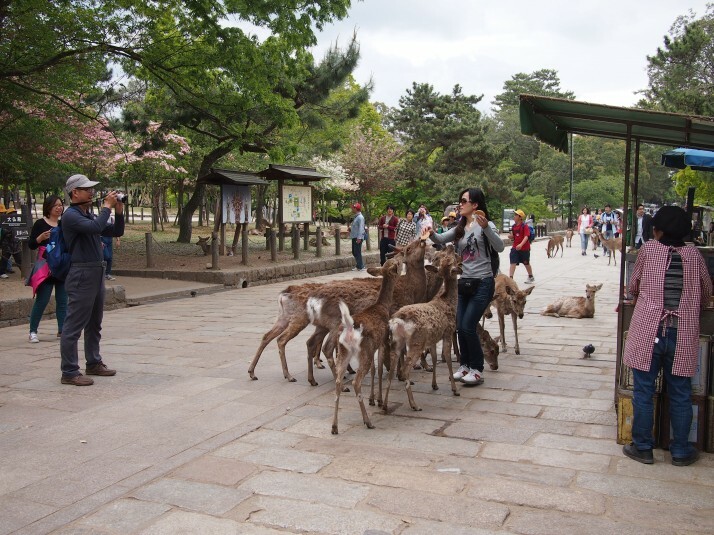 Why, they’re tourist-harassing, biscuit and paper-eating deer! 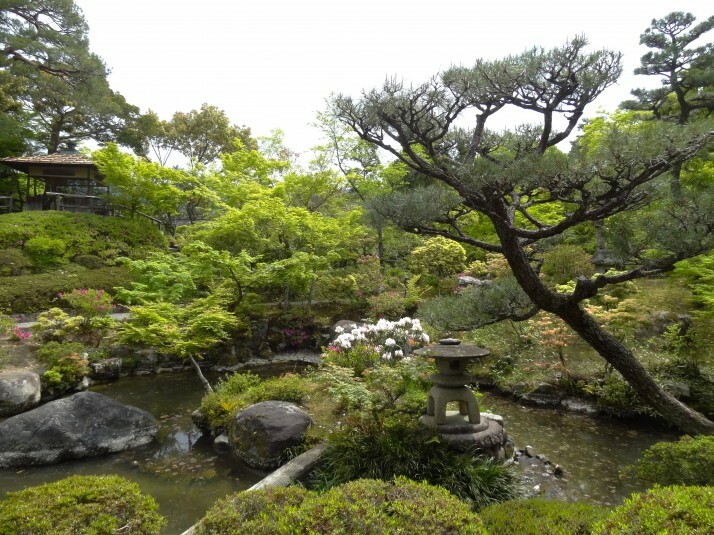 Instead of the “must-see” Isui-en garden, we opted for the smaller (and free for foreigners – bonus!) neighbouring Yoshiki-en, and while it wasn’t as meticulously maintained as Isui-en, it was beautifully varied and consists of a pond garden, tea garden, and the first moss garden we’ve seen in Japan. The delightfully serene Pond Garden in Yoshiki-en. I could sit here for hours. 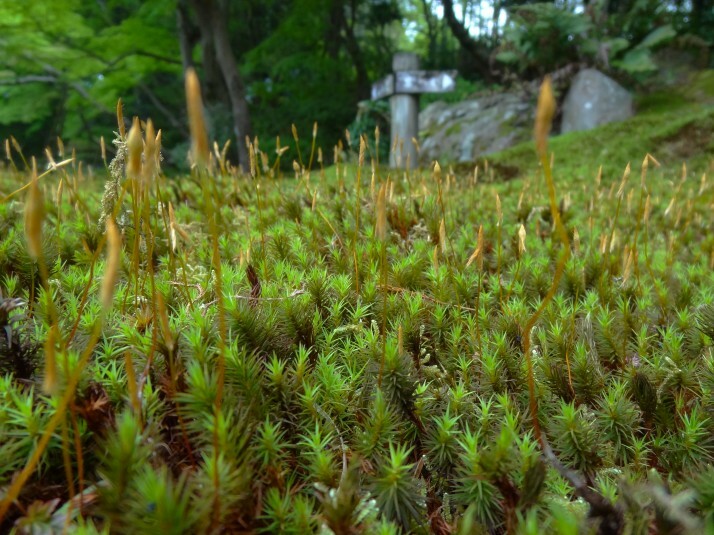 The Moss Garden in Yoshiki-en. A mosst-see. 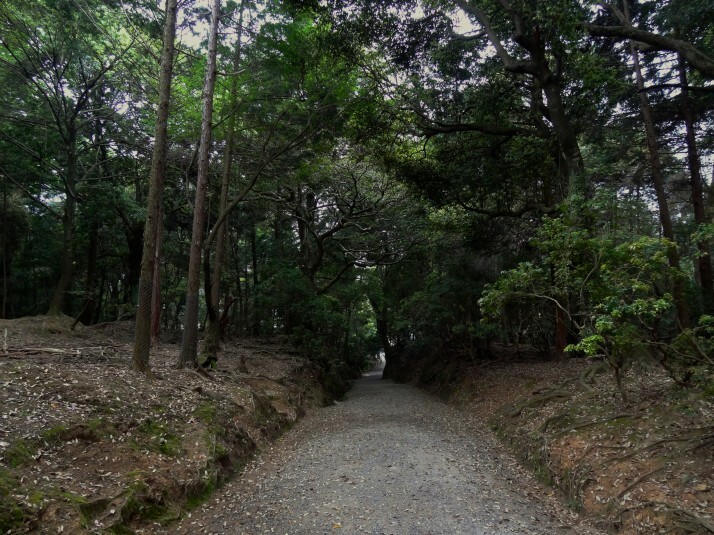 The primeval forest lies to the west of the Nara-kōen park and the Tōdai-ji, and we found it to be a lovely shady walk that the further we went, the darker and more claustrophobic it became. 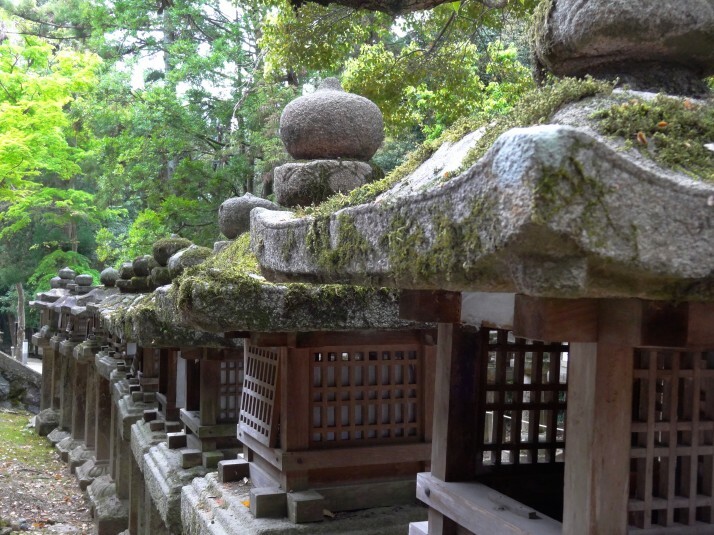 Then in the darkest depths of the tree cover, rows of stone lanterns lined the path and lead us towards the sanctuary of the Wakamiya Jinja Shrine. 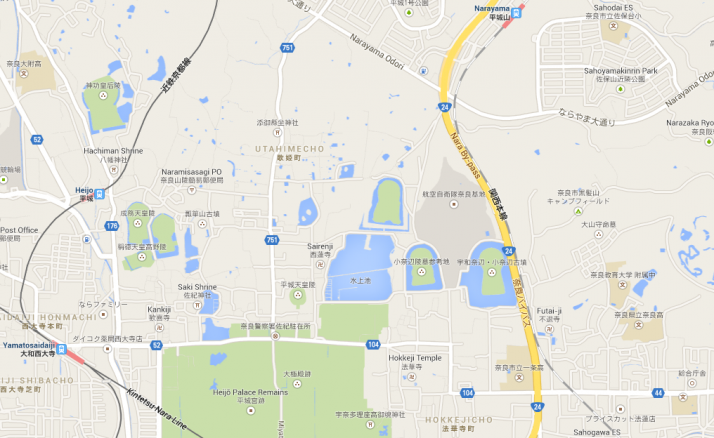 Intrigued by keyhole-shaped features on the maps and aerial photography of Nara, we hired a couple of bicycles and went exploring. These large, man-made, tree-covered mounds have quite substantial moats around them, and it turns out they’re burial grounds from ancient Japanese times, which figures, but we didn’t find much information about who was buried in them. 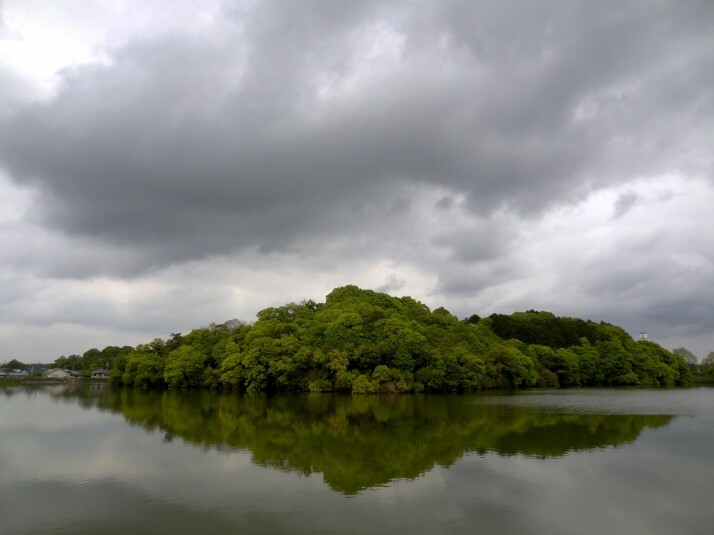 Once the Imperial and Administrative centre of Japan during the Nara Period, nearly every trace of the buildings that stood here were either relocated, looted for materials or destroyed when the capital moved to Heian. 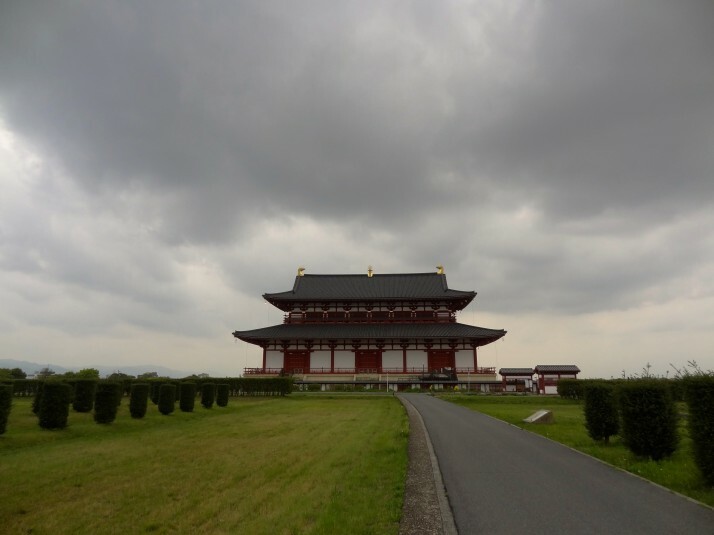 Largely used for agriculture in the 1300 years since, the site is now a large-scale reconstruction project, with the southern Suzaku Gate, East Palace Garden and Former Imperial Audience Hall completed. We didn’t venture into the museum or the excavation exhibition hall, but we did stop for lunch about half-way through the grounds. It took us about 10 minutes to cycle through the palace site, which says something about its size, and how much work it’s going to take to rebuild it all. Situated near the north-south canal to the west of the city, this temple boasts that it was the first to have twin pagodas in its grounds. Speaking of pagodas, the temples leaflet says the following which I didn’t previously know..
“Pagoda” means grave in Pali, the ancient Indian language, and it was called “Stupa” in Sanskrit. Pagoda means the grave of the Buddha. 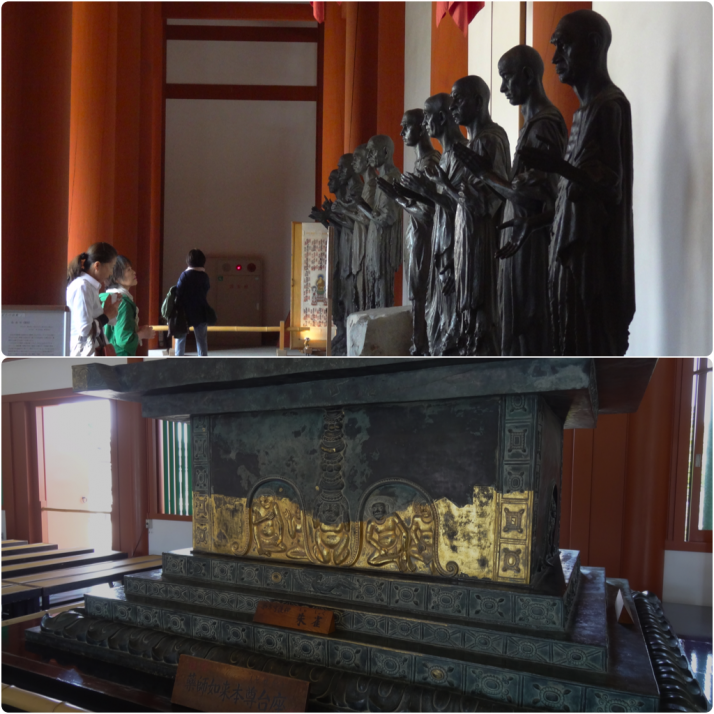 The various temple buildings contain a wealth of Buddhist artefacts, which made it feel more like a museum than a place of worship. 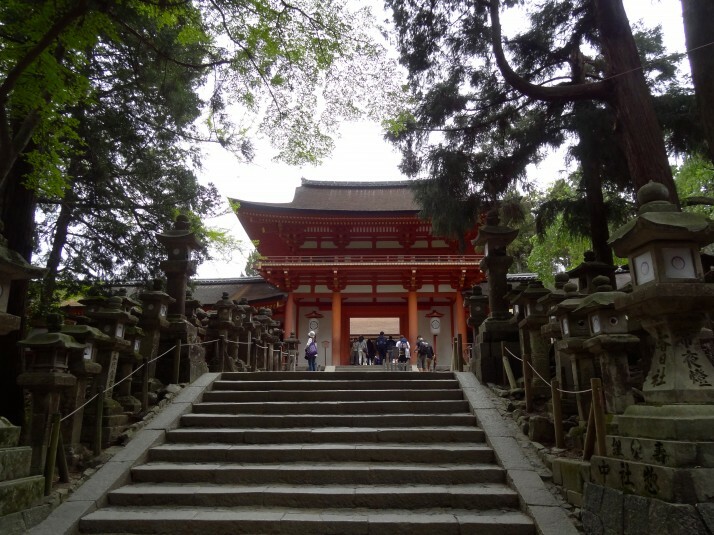 We found lots of diverse things to see in Nara – more than we were able to fit into the couple of days we spent there. 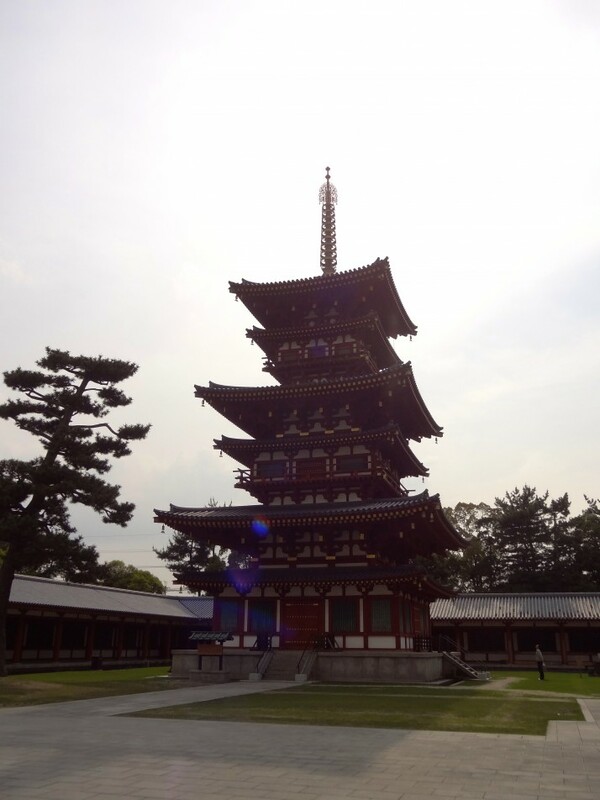 We could easily have doubled our time and filled it with gardens, temples and shrines. 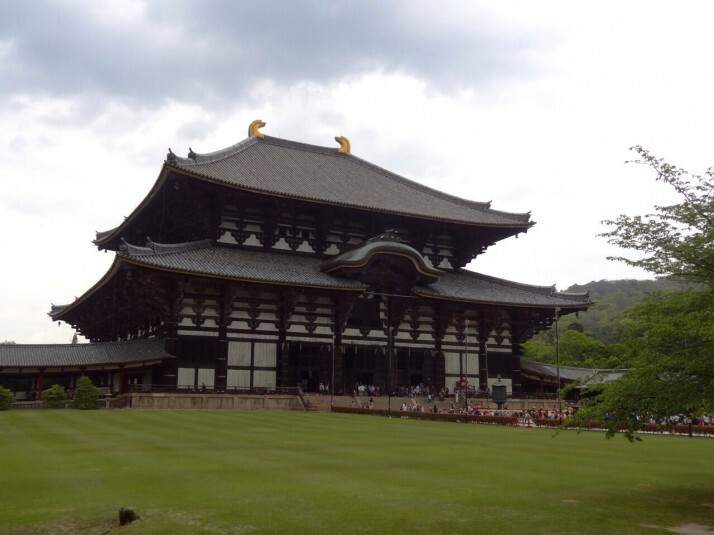 This entry was posted in Places and tagged Japan, Nara on June 4, 2014 by Andrew.